British cats are sweet, intelligent, shy, unobtrusive and moderately curious. They feel themselves as alone and in the company of other Pets. The British love children and have good health. To define the British kitten among kids of other breeds quite easily. British kitten has a huge resemblance with a small Teddy bear. You can find it on a short dense coat, resembling the fur of the North American mink, chubby cheeks, small, slightly rounded lugs, expanded at the base, and a large, round, widely spaced eyes. From other breeds, these cats are different and short, fairly thick tail with rounded tip. A little Brit you can easily decide on short thick legs, rounded head and short neck. That's what these kittens at age 4-6 weeks. At this time British kids are the cutest. In a further period of growth kittens develop quite unevenly. They begin to stretch in length, to spread wide. At this stage of the development of young Britons you can also see that their ears become unnaturally large, and his legs are too long. This period "ugly duckling" different blood lines occurs at different times. In some people it starts in 2-3 months, others 6-7. Eye color kittens depends on the color of their hair. Animals of the silver color green eyes or light brown, shaded silver and shaded Golden British green. Have white kittens they are usually blue. But most British cats eyes have shades of Golden-copper scales. British kitten is the best option for people who spend a lot of time away from home. That is why dogs are called cats for businessmen. Their respectable appearance, calm temperament, self-esteem and a surprisingly pleasant character allow you to gain British cats incredible popularity among people all over the world. British cats have a lot of fans. These animals are remarkably large, beautiful build, luxurious plush fur and a variety of colors. Make your pet has become, take the time to choose the best kitten healthy, happy and meets all breed standards. 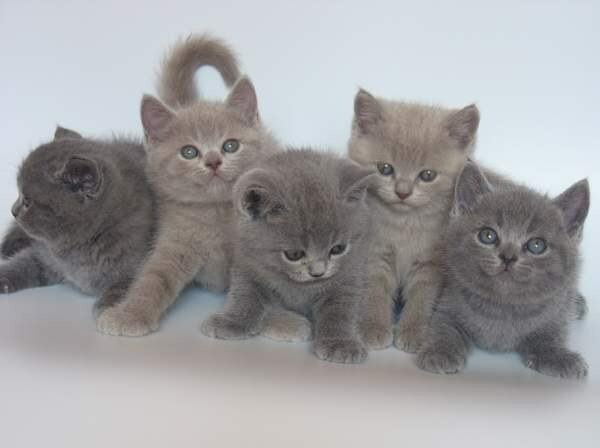 Deciding to buy a kitten of the British Shorthair breed, contact your local feline club. You tell ' catteries with kittens or plan binding. Note that on particularly promising animals sometimes are written long before their birth. But if the offspring of Champions exhibitions does not interest you, choose any vending baby from existing. A pedigreed kitten can be purchased at the age of 2-3 months. To see a future champion in a fluffy animal to a layman it is impossible at this age the kittens are disproportionate and a little similar to future imposingly handsome. If you want to buy a kitten for future breeding and exhibitions, invite expert on the breed. He will check the documents of the animal and will examine the kitten closely. Buying promising animal show class, be prepared to spend on it a considerable amount. Expensive and females breed-class parents Champions. Prizes at the exhibitions they will not win, but will be able to participate in breeding. But cats in this class and category of animals pet are much cheaper to knit these cats is not recommended, but they are perfect for the role of a pet. Before inspecting the kittens look at their parents - at least in the pictures. And the mother and father of the kittens should be fully consistent with the standards of the breed, have strong bones, well-developed massive head, wide chest. Check the genealogies - it must be specified at least four knee titled ancestors. Relatives of Britons should not be a Scottish fold - they are different species, not subject to mixing. Watch cat mother and kittens. It should be quite sotsializovanomu - without the vagaries to go into the hands of the owner, not to worry. More than "home" would be the mother, the easier it will get used to the new house her cubs. If you dream of a large cat, consider that cats-the Brits are much smaller cats. The son of a graceful mother may well to grow big impressive size. Inspect the kittens. The best choice is most active, curious and happy baby from the litter. Take the vending kitten in his arms. It needs to be well well-fad, differ thick coat, balanced round head with small ears set well apart and round amber eyes. Check the body of the animal, a good Briton has strong straight legs, broad chest and tough body. Rate the shade of hair. It is important that the undercoat is not different in color from the guard hairs. Kittens blue and purple colors should be uniform in color of hair, without the silver on the tips. Long nose, pointy muzzle, and almond-shaped eyes are considered a defect of the breed. If you liked kitten that does not meet strict breed standards, you can purchase it, however, in exhibitions and breeding, he will not participate. But don't buy the obviously sick kitten. Bad breath, watery eyes, dull, tousled hair - telltale signs of illness. A conscientious breeder will never put up for sale a sick animal. If you are offered this kitten, give up the purchase and look for another kennel. In thick, plush fur of a kitten certainly want to run the arm. Makes it so dense undercoat. The Constitution itself is different breed of stocky build with a rounded outline. Although kittens and have a short coat, the impression that they are fluffy. 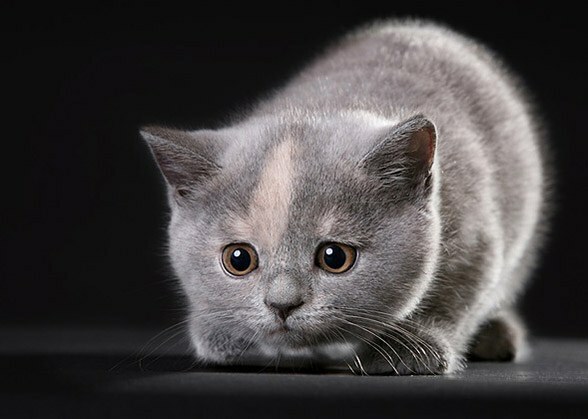 British Shorthair breed of cat the people called simply British. This is a fairly large animal with aristocratic tendencies, and good-natured disposition. Although cats growing up, and took final shape only three years, and cats become sexually Mature not earlier years, have to educate them from an early age. In comparison with other pedigree members of the cat, the British low maintenance, are easily accustomed to the tray, not nasty and not mark the corners of the house, but tend to insist on. The first lessons presents monthly British mother cat. With its filing, he is already beginning to master the toilet and feed himself, but the lion's share of the nutrients it gets from the mother's milk. Since this species belongs to the "dolgoushin, 4 weeks old baby is still very attached to his mother and the sharp excommunication from the usual way could cost him his life. Wanting to choose early pet in the house, educated buyers prefer to meet with British kittens at this age, to choose a favorite kitten, but didn't pick it up immediately. The first vaccine is the baby only 2 months, followed by another recovery period. Therefore, the monthly sale of kittens British should at least be alerted. Really, watch chubby Teddy handsome, clumsily moving on the same thick legs – a pleasure. I must say that the British breed distinguished by the roundness of everything. If the head is round and squat, seated on the same short thick neck. If the tail, powerful at the base and rounded at the end. Eyes perfectly round and widely set. A short coat with dense undercoat finally rounds up the whole "portrait". When one-month-old British kitten not consistent with this characterization, it is not necessary to yield to the assurances of the owner that he will change. On the contrary, it will change in 3-4 months, turning from a nice fluffy ball in the "ugly duckling". It is a feature of adolescence this breed. But if the Briton in a month and has an elongated slim body, thin tail and high legs, it's forever. Some mistakenly believe that the British should have "blue" (smoky gray) color. However, the standard says that this breed of cats has the right to be purple, and chocolate, and black, white and red (red). Considered the rarest silver and gold color with pattern strips. Although the majority of Britons plain, in the months of age the kittens can look through barely visible stripes. It is quite normal and with age they disappear. If the color of the baby is clear at once, the color of eyes do kittens over the ripening period can change. The final version will be visible only to a year or a little earlier. Maybe you should not philosophize, since all of British adults they will still turn yellow. But this is only at first glance. Experts can distinguish the color of eyes of a kitten and the color of the coat what to expect the color of the eyes in the future. It can be bright blue, green, and orange. However, to give the forecast one-month-old is impossible, because the approximate tone is available only in 4 months.